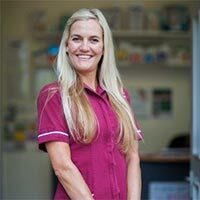 I started working at Twickenham Vets in 2008. My work mostly involves pet consultations and operations, as well as consulting with specialists and sorting out pet passports for those about to travel. I particularly enjoy the surgical side of my job, and also working with my compassionate and enthusiastic colleagues – we all share the same goals and ethics and love working with the patients. At home, I have a foster cat called Ruby Tuesday and usually a host of foster kittens too!